When a business partner breaks your agreement, what is the best way to deal with them? Unfortunately, many business principals (owners, managers) are reluctant to have these tough conversations. Obviously, this isn’t helpful, as it leaves the organisation at a distinct disadvantage and leads to substantial losses. In this video, Paul Allen, author of the book Take Back Your Margin! discusses how to handle this touchy topic. This year, Paul was a Featured Speaker at the Evolve 2019 conference in Brisbane, where he presented “Take Back Your Margin!” His exciting talk helped attendees learn how to supply customers on their terms—not theirs—and increase profitability within 90 days. What if you could be shown the hidden pitfalls lurking inside the current contractual relationships with your customers that are silently and significantly eroding your margins? To learn more, call Paul Allen at Margin Partners today! Dallas Brooks: I have with me Paul Allen. He’s from Margin Partners and he’s also the author of Take Back your Margin! One of the topics in his book is all about how tough conversations aren’t practiced. Paul, welcome to Dollars With Sense. Paul Allen: Thank you, Dallas. I want to be here. Dallas Brooks: Now, tough conversations aren’t practiced, It’s in your book here, Take Back Your Margin. What tough conversations are you talking about when you’re a supplier? Dallas Brooks: Which is business-to-business? Paul Allen: Business-to-business, correct. And the point here is that suppliers also have the chance to teach their customers how to treat them, about what they allow, what they stop and what they reinforce. So tough conversation is actually saying to suppliers rather than bemoaning the fact that you may be feeling squeezed or pressured or actually given a hard time. There may be a place where you need to actually document your concerns with the customer, about how they’re playing their role, and ask them to sit down and talk about your concerns as well. So, it’s actually like taking the discussion to them in a way that’s constructive, but it’s also asking more of the customer to play their role in what is a two-way relationship. Dallas Brooks: So, it might be something along the line of supplying shirts to a major chain, and the agreement was initially that you’re going to get four feet of space with 24 shirts on it, and you, you’re going out and noticing that you’ve only got three foot, six of space with 20 shirts and how you actually approach that. The idea is to take a gradual approach to bring it to their attention and then seek to have it rectified but don’t let it go away—and certainly don’t be scared of not poking or poking the bear. Dallas Brooks: Sure. So, I’m in that situation, I’ve got all my facts and figures there, and I say that out of the 55 stores, 50 of them are only offering me six inches less for less products, whatever the case may be, that was part of the agreement. I really would like to still be a supplier of yours because it’s obviously good for my business and I’d like to think it’s good for your business. So how do we resolve this? Well, it’s right back to how do we resolve this? Paul Allen: Exactly! and the great thing is most customers, even though some suppliers bemoan customers, they’re good people who want to do the right thing, but they may not know. So in those moments you put it to them, how do we resolve, one of two things will happen—your line will be met, which is a wonderful way to go forward, or you won’t be, in which case you have a decision to make. Dallas Brooks: Yes, because you and I both know, when we are dealing with these large more often than not multinational retail outlets, they know exactly down to the centimeter, the amount of product, the space that they’re giving you, the amount of facings and the amount of product that you’ve got there. So, you’re being very polite saying that they may not know. Paul Allen: Yes. And again one of two things will happen. If there’s a remedy, we can fix that and everything’s good the way you go. But if not, again the supplier’s faced with a choice. You either have to re-engineer what you’re offering or go back and change the terms of your contract, or not give everything you promised to give, but you can’t let it go. So, we teach people how to treat us. Dallas Brooks: It’s something very interesting. One of your subheadings here is do business, I’m paraphrasing here, do business on your terms. It’s your business, do business on your terms. Paul Allen: Correct! Supply people on your terms, not their terms, and if you know your terms and if you know your cost to serve the customer, you must protect it and guard it with your life because that margin you make is your lifeblood, it’s your cash. Dallas Brooks: And that might be the catalyst of you having a profitable and worthy relationship with that customer? Dallas Brooks: And not having it all and you going broke? And many great things happen when you get people around the table who know your business well, people you trust and you put the problem to them and say, “We need to take cost out of our business, how do we do it to stay in business?” Great things happen in those moments. 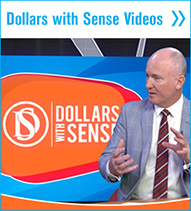 Dallas Brooks: We see this often with suppliers where they insist on a product selling for 99 cents year after year after year, but the one liter becomes 900 becomes 750 and you say we’ll we’re selling it for 99 cents still. Paul Allen. Yes. Shrink flashing is what it’s known as—the price stays the same but companies to respond have to reduce their cost to serve by reducing the size of the products. It’s tough but it’s a choice. You either go out of business, or you shrink your product to protect your margin. They’re just the decisions you have to face, and if you don’t, it’s only going to hurt you later on. Dallas Brooks: And then it’s got a lot to do with your strategic plan as a company. Do you sell one type of product to the major chain and another type of product to the smaller outlets? Paul Allen. Correct! And you’ve touched on a good point there. You have to know yourself, you have to your business and your cost. Once you know your cost and the other thing I’d say is where you can generate incremental revenue. Incremental revenue comes from upselling. McDonald’s does it brilliantly when you drive thru and order a burger, they’ll say, “Would you like fries with that?” They never give you the fries for free—if you say “yes,” you always have to pay. Dallas Brooks: Paul, thank you. Paul Allen: Thank you, Dallas. Dallas Brooks: I’ve just been talking to Paul Allen from Margin Partners regarding his book, Take Back Your Margin! If you’d like to know more information about this, go to Dollarswithsense.com.au, follow the appropriate prompts, and if you’d like to be one of the half dozen to make contact with us, we’ll ensure that Paul sends you this book.